Practical Catholic Junto Book Now Available! 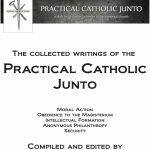 Friends of the Junto, We are pleased to announce the release on Amazon of the Kindle book, The Collected Writings of the Practical Catholic Junto, containing 23 essays gleaned from our private meetings. Although some of the essays have been converted to posts on the PCJ blog, many are original works that are published here for the first time. We invite you to read this extended collection of our writing. Thank you for your interest in, and support of, our work. St. Thomas More, pray for us!